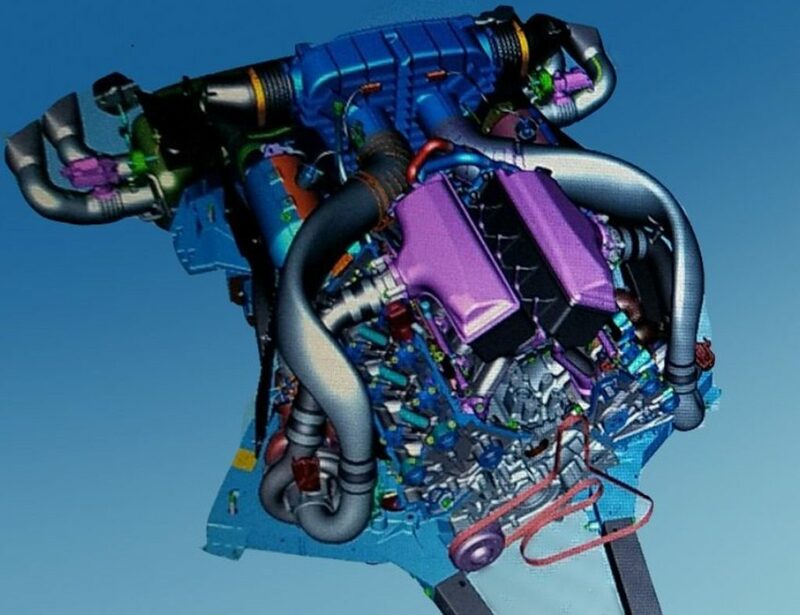 Editor’s Note: With the excitement surrounding the General Motors’ confirmation of the new mid-engined C8 Corvette, we asked our friends at Summit Racing to share their thoughts about what the future holds for the small block Chevy engine as it continues to evolve through its fifth generation with the new LT2 slated to power the 2020 Corvette. What can we expect from that engine, and from even more capable versions to be found in the Z06 and ZR1 (and/or Zora)? 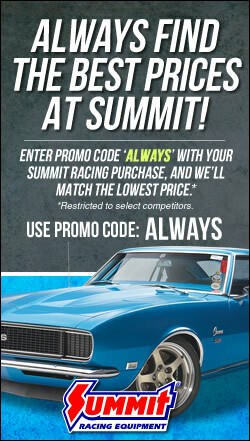 Brian Nutter, Summit’s resident expert on LS and LT engines, weighs in below. Engineers at General Motors Global Propulsion Systems have a history of paying reverence to their own past by rebooting engine designations. For instance, the LT1 was available in 1970-72, then again in 1992-97, and then again in 2013 as the first Gen. V small block Chevy engine. GM engineers also have a sense of humor, and sometimes offer little hints about their future plans. An example is GM making the pecking order of engine codes the same in the C4 and C7 Corvettes: LT1s in the base models, LT4s in the mid-range, and the LT5 serving as the top dog. So what hints could the new engine code LT2 give us? That answer might come from the introduction of the C6 Corvette in 2005. The engine switched from LS1 to LS2. The LS2 was an evolution of the LS6, and ushered in the Gen. IV LS engines. The LS2 and LS6 had things in common like the 24X reluctor crank, 3-bolt cam, and 243 casting cathedral port heads. The biggest difference between the two engines was the displacement, which increased from 5.7 to 6.0L. 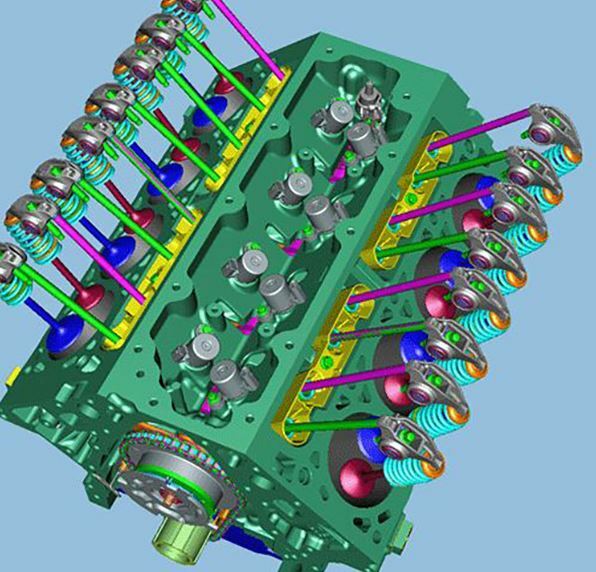 How Might GM Engineers Increase the LT2’s Displacement to Make More Power in Future Engines? This isn’t likely, but we guarantee it was considered. From a hot-rodder’s perspective, how about increasing the LT2’s displacement to 6.6L? Just borrow the forged steel 3.858 in. 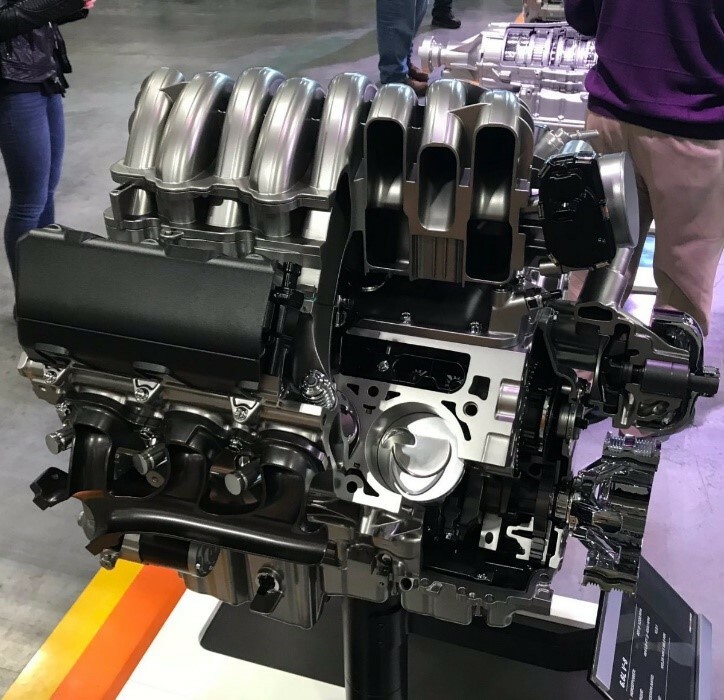 stroker crank from the new 6.6L L8T powering the 2020 Chevy Silverado and GMC Sierra to make it happen. Not if GM utilizes the latest-generation Dynamic Fuel Management cylinder deactivation technology. An improvement over AFM, DFM has 17 different cylinder firing patterns and switches seamlessly between them to provide just the right amount of power. We will probably see improvements to the cylinder heads as well. There is room for improvement as shown by the new Edelbrock Gen.5 heads. What other technologies could be applied? People may not realize the name GM Powertrain was changed to GM Global Propulsion Systems in 2016. 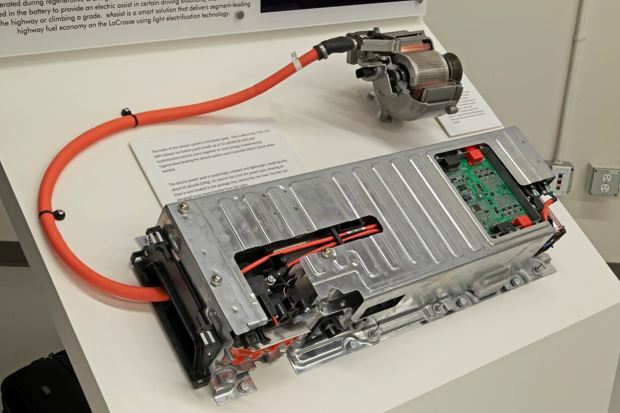 Part of the reason for the name change stems from the ongoing integration of electrified hybrids. Corvettes have always had good fuel efficiency and don’t get saddled with the gas-guzzler tax. To add more power and performance to future Corvettes, we could see GM engineers implement their eAssist system called BAS 3 (Belted Alternator Starter). It bolts simply to the accessory drive in place of the alternator. It’s a proven technology currently used in the 2016 Silverado and improves mileage 13 percent. Although it adds another 100 pounds, it provides 13 more horsepower and 44 foot-pounds of torque. With an automatic, it serves as the starter motor for low-speed start/stop and take-off. Another benefit to going mid-engine? With the front of the car freed up, an electric motor could drive the front wheels when added forward grip is required (like Porsche did in the 918). Incorporating a variant of the 200-hp Chevy Bolt electric motor up front would give the ultimate Corvette a cool 1,000 hp when mated with a twin-turbo LT9. Not only does it add grip in a straight line, it would use an e-diff to meter power independently to each of the front tires to help them pull the car through a corner. What about the 5.5L DOHC engine variants that’s been rumored to power the Z06 and ZR1/Zora? These variants will become the Gen. 6 small block. GM has already shown a willingness to supercharge both the Z06 and ZR1, although they did receive different sized superchargers. Mostly likely, the DOHC 5.5L used in the Z06 will get turbos. Before getting into the tech of a turbocharged DOHC, let’s dream a little dream here for a high-revving naturally aspirated motor for the Z06. These would likely get the LT6 or LT7 designation. How would GM do it if they decided to go that direction? First, it would have to have a clear advantage over the LT2. We think it would take another 100 hp. Is 600 hp possible naturally aspirated? Well, the 5.2L Shelby GT350 makes 526 hp and 429 ft.-lbs, the 4.5L found in the Ferrari 458 makes a reputed 562 hp. The closest would be the 4.6L found in the Porsche 918. It makes 600 hp at 8500 rpm. In theory, the Z06’s larger 5.5L could make 600 hp at 8000 rpm and do it more reliably. How would it do this? Taking a cue from the aftermarket, they may run tubular headers and a twin-throttle body intake similar to the Edelbrock Cross-Ram LS3 intake. What are some other considerations? The Corvette program has always valued packaging efficiency in their engines. DOHC engines are wider than a pushrod engine, so deck height needs to be shorter for packaging. That said, GM always likes a little wiggle room for added displacement down the line. Purely speculation, but what are several ways 5.5L could be achieved? Based on current 4-valve trends, a deck height of 8.780 would narrow the engine block. With smaller bore spacing (4.252?) than the pushrod LT1, the length of the engine would be shorter too. Although the cam covers will be significantly wider than the pushrod engine, every bit helps. What kind of tech would be found in the boosted LT8/LT9 version? First, by going mid-engine, Chevrolet gave themselves more room for a pair of turbos. This wasn’t easily done in the front-engine C7, so the 2650 Eaton supercharger was a logical choice. We could also take cues on its technology from Cadillac’s new Blackwing engine. That 4.2L twin turbo V8 makes about 550 horsepower and 627 ft.-lbs. It’s possible the Z06 would get smaller turbos than the ZR1, but maybe not. 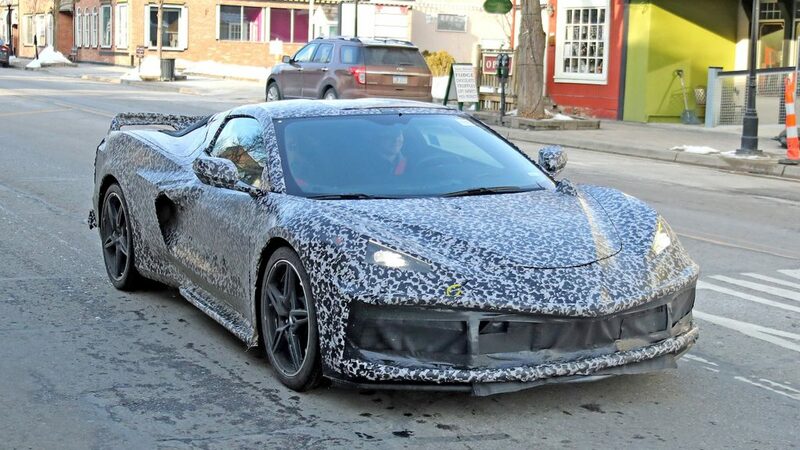 What would set the ZR1 apart in terms of grip and acceleration would be the before mentioned electrification of the front wheels. This would also play into the weight savings and track focus a Z06 has traditionally versus a ZR1. Note in the top image of this article that the turbos are feeding the intake manifold directly. This points to the use of air/water intercooler bricks inside each of the dual plenums similar to what is used in the LT4 and LT5 today. The Chevy engineers will want to make more than the current LT5 engine, so you could expect it to make something around 775-800 hp. Whatever happens, the C8 will go toe-to-toe with the world’s most exotic supercars and do so at a fraction of the price. The tech found in the Gen. 6 engine will be transferred to other cars, and even trucks. To the fine folks at GM Propulsion, have fun with this one and keep up the good work!